I tried, but I couldn't get among them, enter their circle. Not myself but not even my stretched arm with my iPhone. 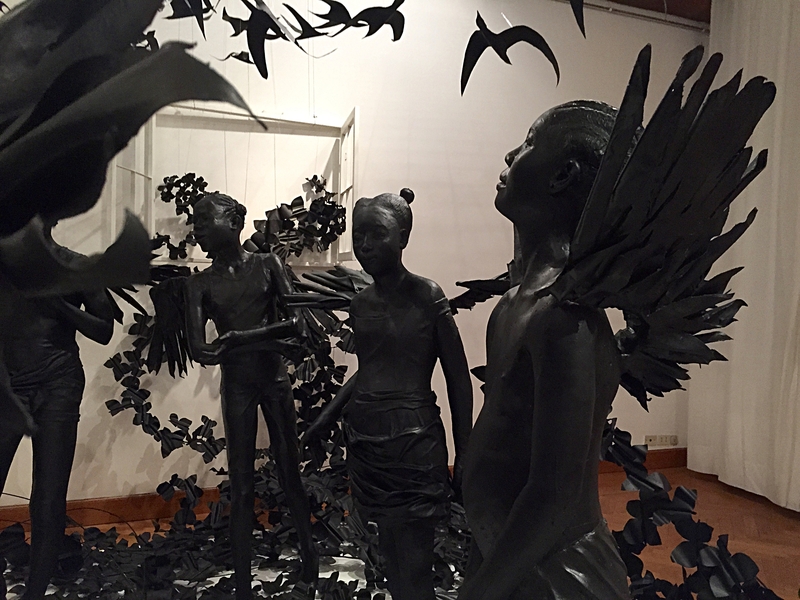 They are a group of girls, well actually: life size statues of girls, and their wings are made in dreams to protect them from uninvited visitors. Keeps them out, these wings, such visitors. Prevents them from entering the inner space of the girls' secure circle. It seems this is unusual. Nigerian girls are, so reports the artist in an interview, not always asked about who visits them or what happens to them in their years of early puberty. This is how Peju Alatise phrases it: 'at a delicate metamorphic stage the girl is exposed before she matures.' The artist in her practice interacts with young girls between 7 and 17 years of age listening to what they have to say. From that she published a book about a young Yoruba girl living in two worlds. As a nine year old rented out servant working in Lagos - the real and by adults neglected world - and as a flying girl in an imaginary world of birds and butterflies. To escape from 'thingification' and 'sexualization,' as the artist calls it. Will the visitors enjoy the artwork in Venice? Actually it doesn't matter. My frustration not being able to position myself for a good photograph, turns out to be intentionally created so. Flying Girls was produced and installed with a clear aim to facilitate smaller people and not grown ups. A way of prioritising children the artist would like to see applied not only to this artwork, but to some laws of the country too.